Bank Holiday Weekend - Time for some Family Fun Time - but where? Did you know there is only two weeks of the summer holidays left? Have they gone by in a blur? Do you still need to buy their school uniform and supplies? Clerkenhill Adventure Farm, in Slebech, offers a selection of exciting and interactive outdoor activities to enjoy. The wonderful staff at Clerkenhill Adventure Farm are celebrating 10 years this season and have built a special NEW Adventure Castle, with rope bridges hideouts, slides and climbing frames for all to enjoy. There are two adventure trails. You can take a stroll along our safe adventure trail through the spooky woodland with lots of interesting swings and slides and sights along the way. You can watch out for giants, bears and spooks! There is even a beach, but beware of the sharks! You can have a chat with the animals around the park and parents you can watch your children laughing and playing in the numerous large play areas which include giant tube tunnel slides. The unique Frizbee Golf allows for a bit of friendly competition. The Frisbee course follows similar rules to Golf but instead of hitting a ball with a club towards a hole in the ground you throw a Frizbee towards a ‘basket’. Your challenge is to throw the frizbee into the basket with the least amount of throws. Each fairway has a par rating & varies in distance & difficulty from its neighbours. Fairways vary in distance from 14 metres to 90 metres. There are many obstacles and challenges to guide your Frisbee through. You will not be able to make excuses Frizbee Golf can be enjoyed by everyone. 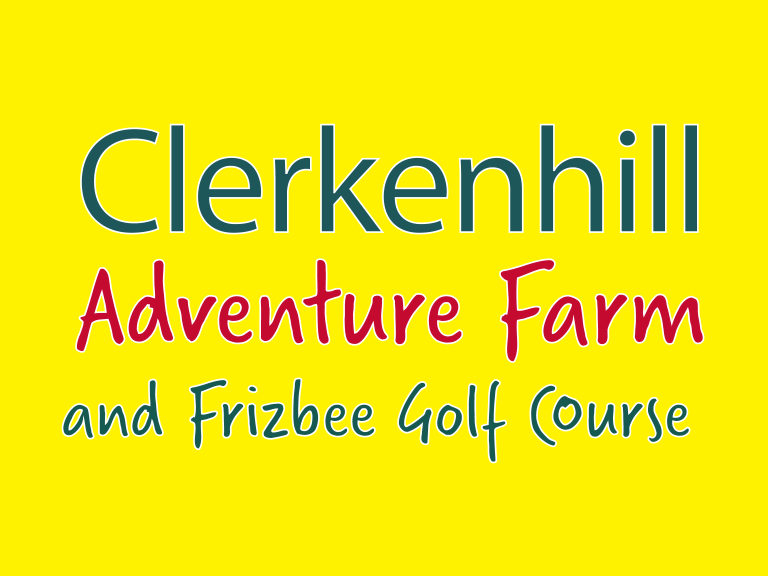 Clerkenhill Adventure Farm and Frizbee Golf is open from 10am -5pm everyday and is open every weekend until the end of October. It will be open everyday throughout the October half term if you do not get there before the end of the summer hols!